Earlier, Ravichandran Ashwin and Kuldeep struck early as West Indies lost their top-order in the first session in which they scored 86 runs. 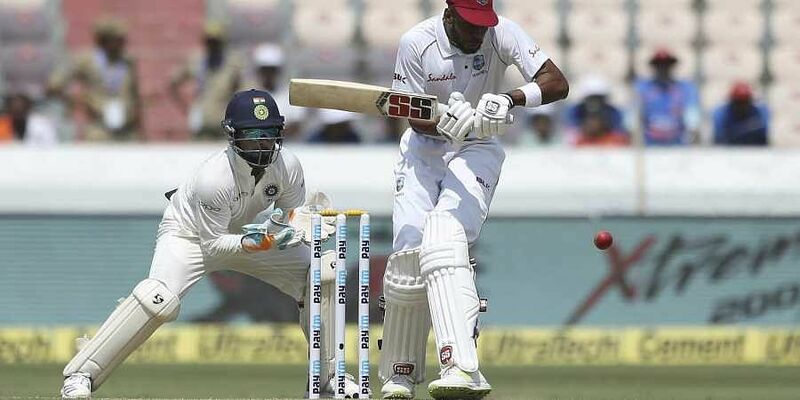 HYDERABAD: Indian spinners went off the boil in the final session as all-rounder Roston Chase hit a gutsy unbeaten 98 to take the West Indies to a respectable 295 for seven on the opening day of the second Test, here on Friday. Chase, along with skipper Jason Holder (52), did enough to ensure that the West Indies will have a good first innings total to fight against a heavyweight Indian batting line-up. Not being able to dismiss the middle and lower-order was a problem in England and it once again turned out to be the bowling unit's bane as the Chase-Holder duo added 104 runs for the seventh wicket. In England, it was the pacers, here it was the spinners and only one wicket fell for 102 runs in the last session. Nonetheless, Umesh Yadav (3/83 in 23 overs) bowled his heart out on a good batting track while left-arm wrist spinner Kuldeep Yadav (3/74 in 26 overs) was also impressive during the first two sessions. Debutant pacer Shardul Thakur left the field complaining of groin strain after bowling merely 10 deliveries and the Indian attack was reduced to four men. It seemed good enough till tea time but the lack of a fifth bowler did have its effect in the final session as the two senior spinners Ravichandran Ashwin (1/49 in 24.2 overs) and Ravindra Jadeja (0/69 in 20 overs) lacked a Plan B to dismiss a set Chase. That Jadeja didn't even have a Plan A was evident as he bowled flat out but wasn't even restrictive like Ashwin. Prior to the match, when Chase was asked about doing a Jamaica encore, he replied: "Anything is possible." He walked the talk and read the pitch better compared to his top-order colleagues. He understood that it was a flat track and played most deliveries on the front-foot to meet the ball early. When the spinners fired in the faster ones, he was quick to lean on his backfoot. In all, he hit seven boundaries and a six during his 174-ball knock. 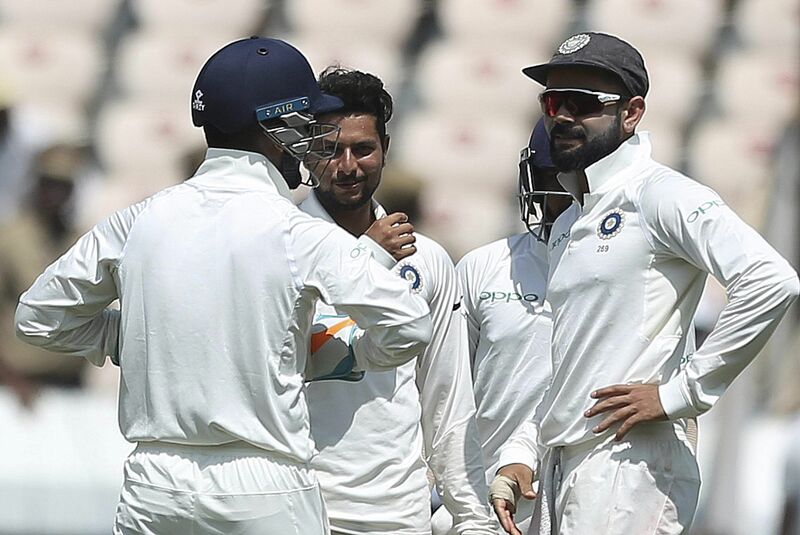 However, it was India, who had started the post-lunch session on a dominant note with signs that another batting debacle from the Caribbeans looking imminent. Shimron Hetmeyer (12) offered no stroke to a googly and was adjudged plumb in-front. Sunil Ambris (18) played a loose shot as the Caribbeans were left stuttering at 113 for five. Chase and Shane Dowrich (30) then added 69 runs for the sixth wicket before Umesh got the ball to reverse trapping the keeper leg-before. While the umpire initially gave not out, skipper Virat Kohli had a successful DRS review. Earlier, Ashwin and Yadav struck early in the session as West Indies lost their top-order in the first session in which they scored 86 runs. At the stroke of lunch, Shai Hope (36) was dismissed by Yadav as India gained the upper-hand. Opener Powell, who scored 83 in the second innings at Rajkot in the first Test, struck four boundaries. He successfully reviewed a leg-before call off Ashwin's delivery as TV replays showed a big inside edge. But Powell did not survive long as Ashwin flighted one and the batsman, trying the inside-out lofted drive, failed to get the elevation to be caught by Ravindra Jadeja at cover. Powell's opening partner Brathwaite showed better application compared to the first Test as he was ready to dig in his heels and defend doggedly. However, not scoring runs did put pressure as he looked clearly uncomfortable at not being able to pick Kuldeep's wrist-spinners. In fact, he was facing problems with Kuldeep's incoming delivery -- the stock ball for a chinaman. One such delivery ended his 68-ball vigil with a delivery that spun sharply into Brathwaite as the batsman played to a wrong line. The stand-out shots of the first session were a couple of back-foot punches by Hope off Umesh Yadav's bowling. He also hit a front-foot cover drive before Umesh angled one in to get him leg before.